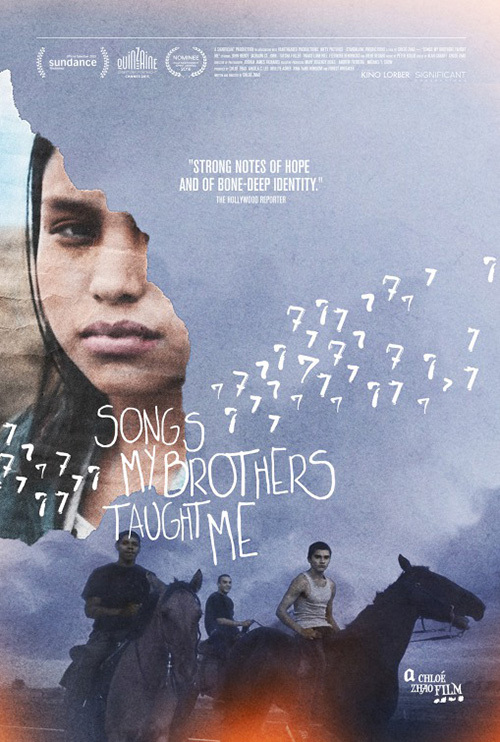 There’s some weirdness happening in the poster for Songs My Brothers Taught Me (limited March 2), but not enough to distract from the uniqueness of its handwritten scrawl and layered collage. For instance: why are there creases on the image in the top left but nowhere else? Why isn’t there a shadow or something to separate the top image from the bottom when there’s a distinct rip line proving they aren’t on the same plane? Besides those points of contention, however, I really like the feel of it. The paper looks pulpy—something you would draw on in an art class. It’s imperfect and gritty with a gorgeous blue/gray sky burning in orange at the bottom. There is character that the original advertisement doesn’t quite deliver. 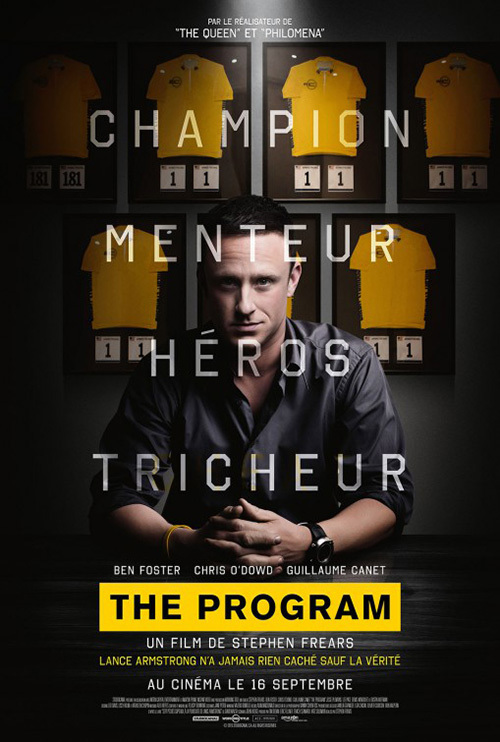 That’s not to say Le Cercle Noir‘s Cannes design isn’t good. It is. 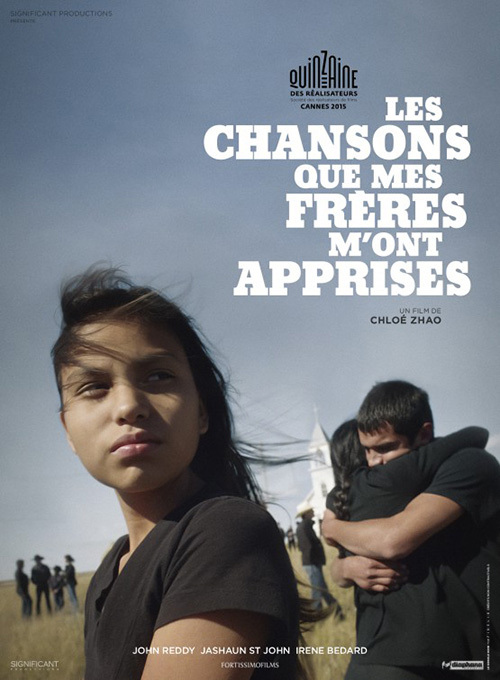 I just think the sense of loss and sadness comes through more on the English-language entry rather than a sharp photograph. 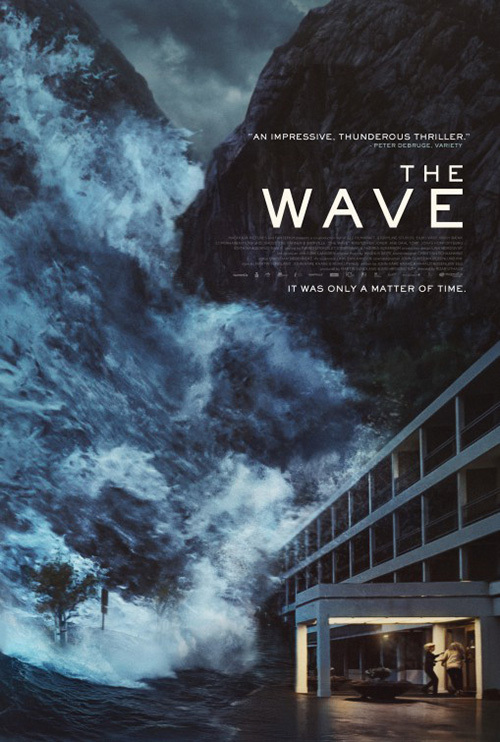 I feel the same with the English-language poster for The Wave (limited March 4) by Gravillis Inc. There’s simply a greater sense of danger than the one done by City Rain Design. The latter is too pristine—it looks computer generated in its crispness. 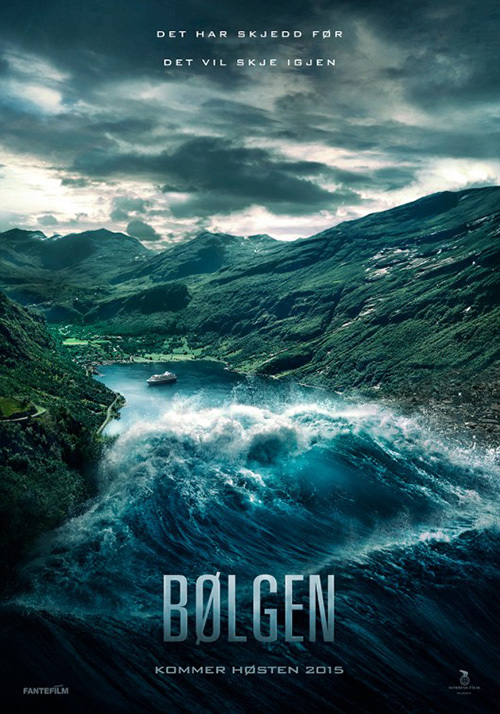 There also isn’t any critical sense of fear because we see this huge expanse dwarfing the wave despite knowing the small city in the distance will be submerged. In contrast, Gravillis’ has an immediate sense of destruction. We are now on the level of those that will be affected. We see people running into their home as a tidal wave fifty stories high or more is about to consume them and us in the process. It’s all about vantage point and perspective. The international sheet shows the wave leaving us to take on something far away. We are voyeurs deciding whether to worry or relish the chaos. The domestic puts us in danger now. We have no time but to worry because we’re about to be swept up in the carnage. For The Program (limited March 18), Creative Partnership has embraced a minimalist aesthetic through metaphor. 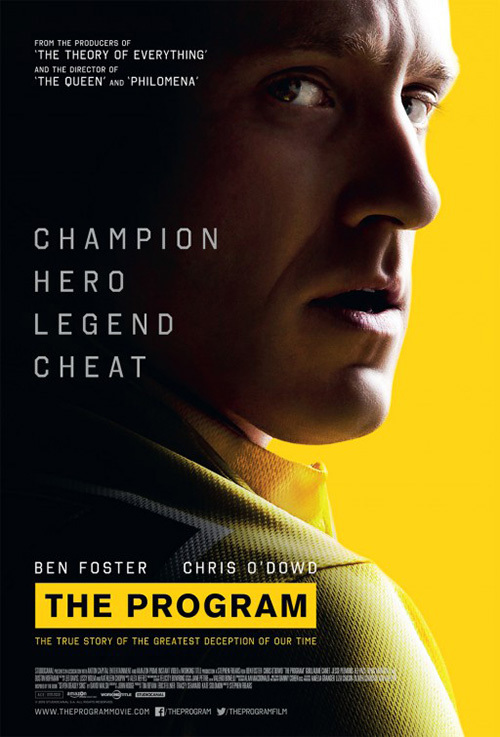 It’s a captivating image in its simplicity of yellow and black, its’ needle doubling as racetrack and pursuer to take down a hero, and the way in which Ben Foster’s Lance Armstong has been transformed into a Christ on the cross—albeit one of his own making. 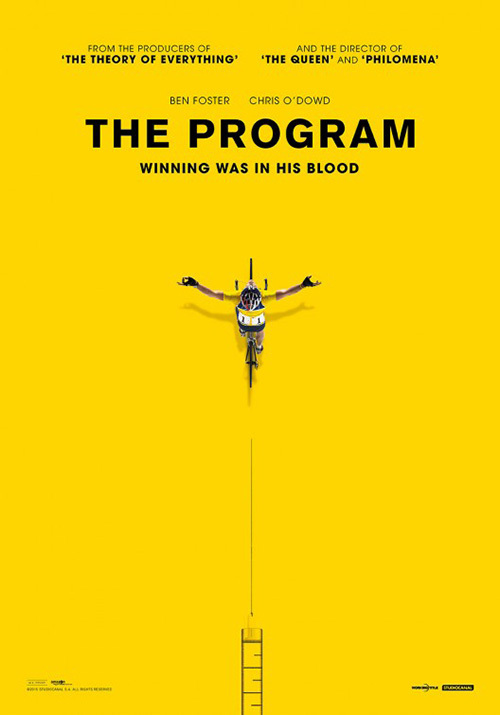 On quick glance that’s what this poster is: a cross with America’s favorite son turned villain stretching his arms wide. That’s a far cry from the other rather boring look over the shoulder in shadow making Foster’s face look plastic and cartoonish. At least the French sheet gives us more to go on with a realistic photo and the jerseys in the background. Too much touch-up work is never a good thing. 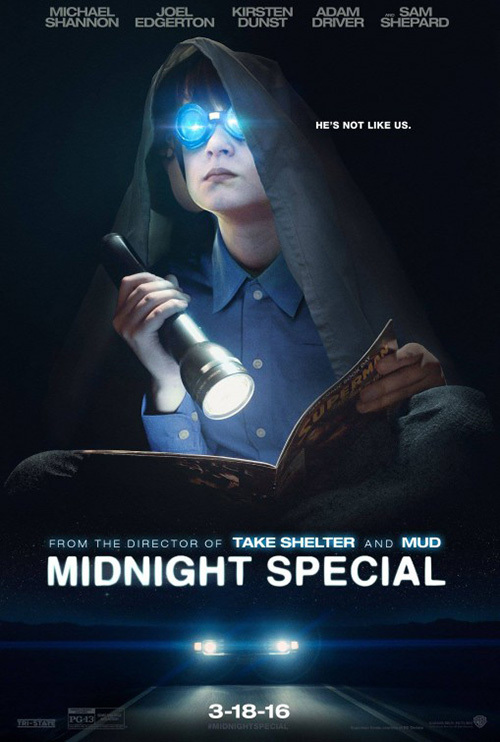 Well, that’s true in most circumstances as the ad for Midnight Special (limited March 18) has its own brand of post-production work. But it makes sense here in its sci-fi underpinnings. The use of light and reflection gives it an otherworldly feel that gets the blood pumping as we wonder what this boy sees in the distance. I do wonder if it would be better without the car headlights below, though. Rather than give us a moment in time we have a diptych instead. Artifice therefore takes over mood. That’s why the quad sheet should be better. Empire Design keeps it a single scene to allow the science fiction tropes of shooting stars and glowing halos speak for themselves. Unfortunately, by placing us into a scene rather than just darkness, the designers show their hand anyway. The actors are obviously Photoshopped onto the trees, the light effects added afterwards. It’s all too perfect—but maybe that’s intentional. Maybe there’s something seemingly concrete to see through within the film as well. 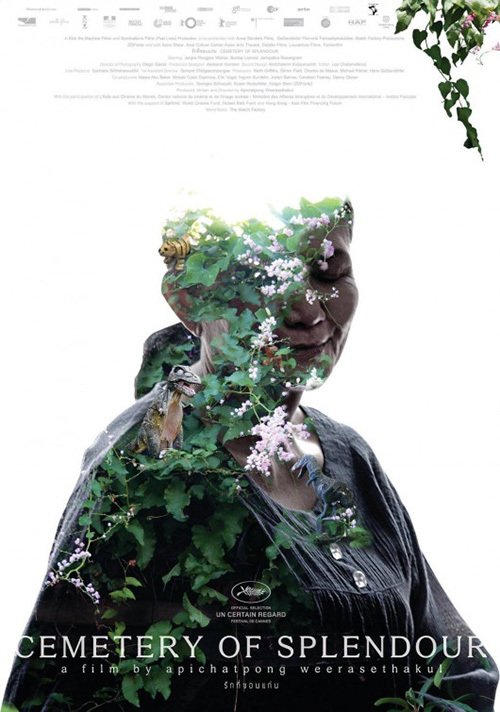 Apichatpong Weerasethakul’s last couple films have had posters as fascinating as the works themselves. Who could forget Uncle Boonmee Who Can Recall His Past Lives and its creepy sasquatch-like nightmare peering back at us? 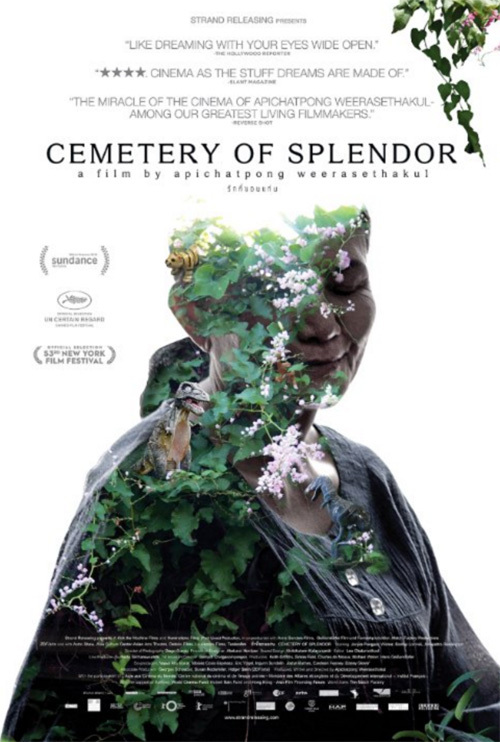 His latest Cemetery of Splendour (limited March 4th) takes a page out of that book as far as its locale of thick foliage, but it goes further into the movie’s concept of dreams, phantoms, and romance by merging place with being. The person in question is Jenjira Pongpas, a lonesome housewife at the center of the tale—her positive space silhouette against white blooming the flowering tree of life and imagination. It’s amazing how the image itself exudes the synopsis’ sense of dream right off the bat, but the coloring and light washing her thoughts into the expanse behind her delivers the romance whether you’ve read the descriptor or not. Her closed-eye smile combines the two into one grand gesture of metaphor. Even though both versions above are virtually identical, I do prefer the original Cannes design with title info at the bottom. The way the first “C” and last “R” fade into the white like her forehead brings everything together—the tiny bit of vine top right perfectly balancing the composition. Because the final sheet had to add press quotes, that balance goes awry. Suddenly Pongpas becomes a triangle shifting our eyes to the title wherein we completely stop. The sense of natural free-flowing adventure is gone. 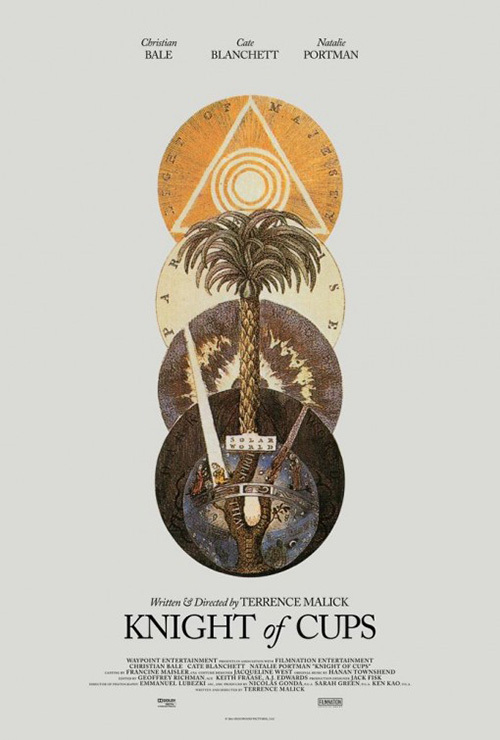 I’m not sure it’s possible to dislike Midnight Marauder‘s teaser for Knight of Cups (limited March 4)—even if it’s just an appropriation of a 1764 illustration by Dionysius Andreas Freher (as detailed by Adrian Curry on mubi). To clean it up and think to use it for this film is inspired enough. It’s pretty, mysterious, and scientifically spiritual if that even makes sense. 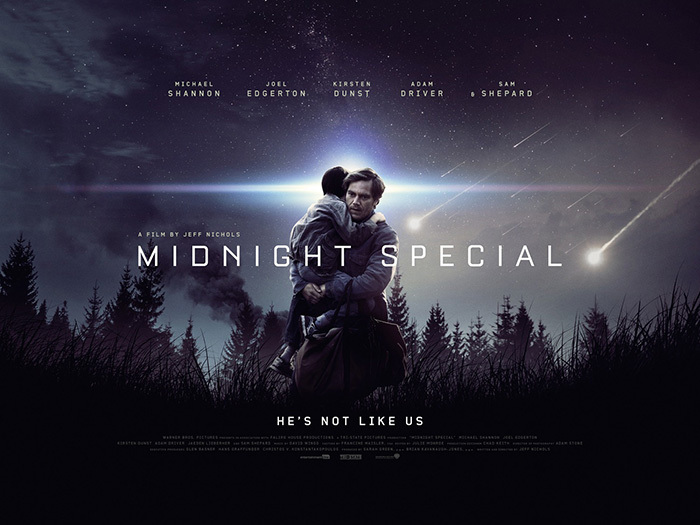 And topping it off with Terrence Malick’s trademarked title font (all caps since The Thin Red Line, mixed with italics since The Tree of Life) is perfection. It’s no surprise the designer found that image while searching tarot cards (the title is the name of one) considering P+A had the same idea with their entry. 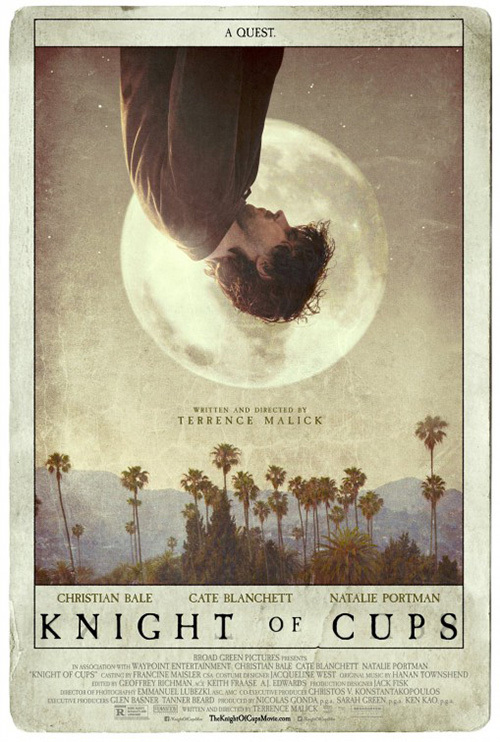 They decided to actually make their one-sheet into a card with Christian Bale as its titular knight. I love the texture and the faded colors as well as the choice to put Bale upside down. I’m not quite sure why the title text is then superimposed on top of itself as a reverse shadow since the image isn’t, but it lends a cool touch. 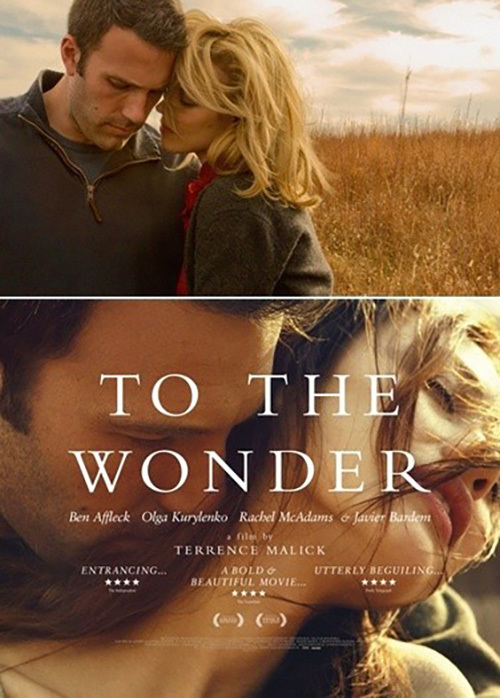 In the end, both overpower Wonderland‘s international piece that pretty much copies To the Wonder. It’s confusing in its angles that go against the horizontal triptych format, the women’s hair creating an odd frame of Bale at center. It’s abstract and literal at the same time and my eyes don’t know what to do with it.